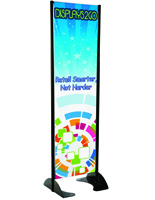 These Advertisement Flags Turn Heads with Alluring Double Sided, Complete Color Graphics! 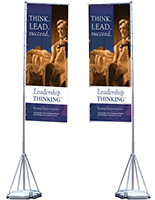 Combine these Feather Flags with Our 17 Foot Flagpoles for a Great Promotional Presentation! Purchase Custom Advertisement Flags for Your Business Online Today! 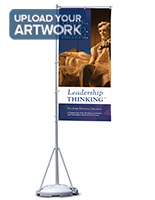 These advertisement flags are printed on a large format digital printer and are ideal for small quantities of signs. The image is printed onto white knitted polyester fabric creating a banner that is equally as durable as screen printed versions. The edges are hemmed to avoid fraying and reinforcement is applied to one side as well as the top to prevent the grommets from pulling out. Both sides of these advertisement flags have positive (right reading) images. This feature is achieved by printing two separate promotional signs and sewing them together with an opaque layer in between. 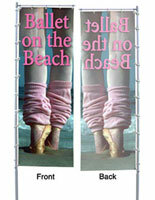 The double-sided advertisement flags are right reading and have full brightness on both the front and back. The price reflects the additional labor, materials and printing necessary for this procedure. For larger quantities we recommend silk screened flags for a better "through print" at a lower cost.